You’re contemplating your day while you finish your first cup of coffee. Diligently making your checklist, adding new tasks and reviewing the ones you didn’t finish from yesterday. As you check off “write checklist” you admire how organized you’ve been and then a thought dawns on you… now what? Task management is not just a list of tasks that you check off when done. To be effective and ensure you deliver on the promises you make to your customers, you need to organize your tasks in a way that helps you decide what should be done first, and what you can set aside. There are different ways to manage Task Lists in Daylite and I wanted to show you how I used Keywords and Smart Lists, to implement How to Accomplish More by Doing Less which utilizes Stephen Covey‘s Task Time Management Matrix made famous in “The 7 Habits of Highly Effective People“ to prioritize my tasks, helping me plan out my day and week. So, how do you prioritize your tasks this way in Daylite? 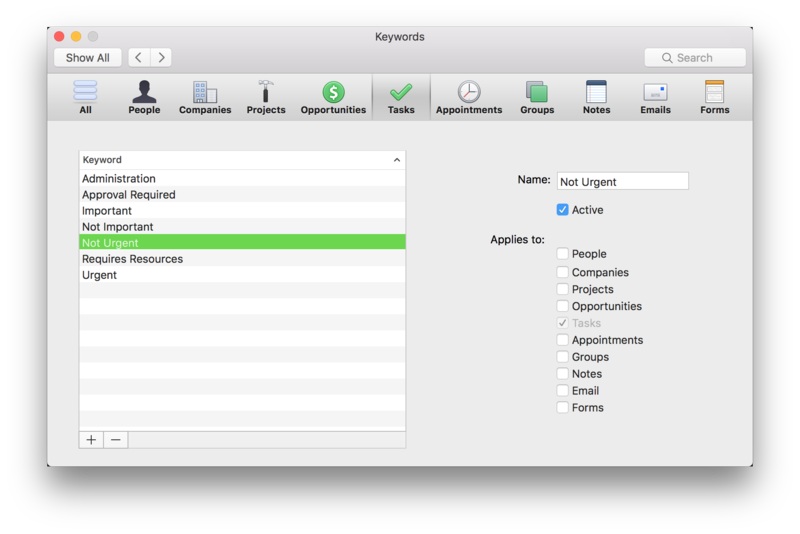 The first thing you want to do is add Keywords that match the Task Time Management Matrix. Time Management Matrix is a well-established task management process but really, you can use these steps to manage your own methods. It is important that which ever method you choose, it makes sense to you and your context otherwise you won’t use it for more than a week or so. Click the “+” in the bottom left corner to create the keyword and type in Urgent. Check off the Tasks check box for each Keyword. Repeat for Not Urgent, Important and Not Important. Alright, so you’re halfway there. Next you need to create Task Smart Lists to automatically filter your Tasks into the appropriate lists. Click the funnel icon in the top left corner of your Task window. Set the filtering criteria to “status” “is not” “done” to see all incomplete tasks. Now, click the “Save as Smart List” button in the top right corner of the filter. e.g. Do Now! ???? etc. Tip: To add your priority Smart Lists to your Favorites bar, click the Smart List and drag it to the top bar of Daylite for easy viewing. So now that you have your Smart Lists, go through your checklist and add the appropriate keywords to your Tasks, as well as whenever you create new ones. You will see the different Smart Lists fill up with the different Tasks. If a task’s urgency or importance changes, all you need to do is change the keywords to match and they will be reassigned to the correct Smart List. Smart Lists are really robust and very flexible. To use the matrix effectively, you can now spend each morning, with that first cup of coffee reviewing your task list. First by going through the urgent and important Smart List and make sure to clear those out since they are time sensitive and will have a big impact if you don’t complete them. Now that those are out of the way, go through your other lists, and work your way through them. 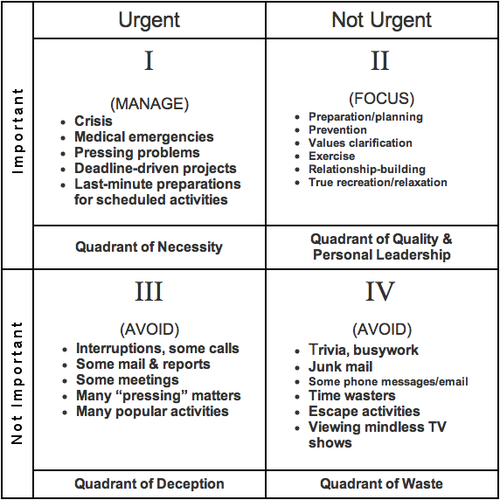 As you work through this process, you will begin to see that while you can triage the big fires, you are actually spending more time in quadrant II. This is the planning quadrant and where you will see the most impact, and gains for your business. 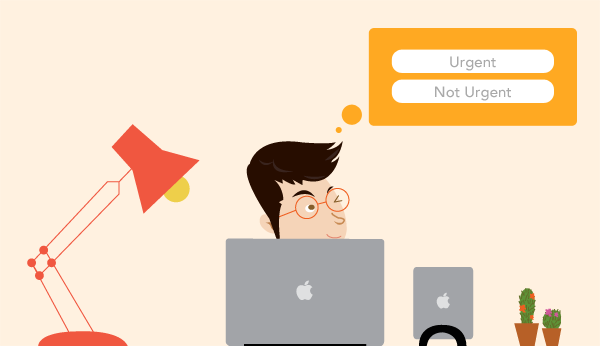 Organizing your tasks is just one-way Daylite helps you deliver on your promises. By helping you filter out the important and urgent tasks from the noise, you can stay informed on what you need to do to make the right call.